Investing in a boat can be pricey. If you were given any advice before you purchased your first boat, most people would say take extra care of your boat, because even the smallest ding can be an expensive repair. You may have only thought that you needed to be careful when your boat was in the water, but transporting your boat to and from the lake or beach is another unfortunate time that your boat can be damaged. That is why it is very important that you have a properly functioning boat trailer to carry your boat to the water! If you have a boat trailer that needs repair, it should be addressed quickly. The longer you drive on that faulty trailer, the greater the chance your boat may get damaged. If you are in Minneapolis, MN, let Anchor Marine Repair handle all of your boat trailer repair needs. Experience and teamwork are two important characteristics you will find with the staff at Anchor Marine Repair. Each technician has worked here for at least 10 years, bringing a combined 45 years worth of experience in boat and trailer repairs. Our 10,000 square feet of space allows us to work year around on your repair needs. Boat trailers need routine maintenance just like your boats do. If you inspect your trailer at least once per year, you are sure to minimize the damage. Since boat trailers interact with water when dropping off and picking up your boat from the lake or ocean, they can easily rust and corrode. Additionally, the tires can dry rot and your electrical lights can malfunction when dealing with water. There are so many pieces to your trailer that it is better to have a professional inspect every nook and cranny of your trailer. 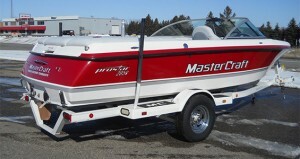 It is time to repair your boat trailer or have us inspect it before it is boat season again. If you are in Minneapolis, MN, give Anchor Marine Repair a call today at (763) 972-3540 to set up a free estimate on your boat trailer repair.